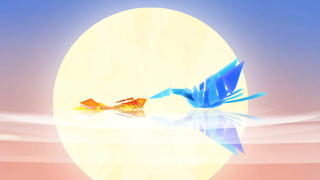 Say hello to Entwined, a fetching new indie game that was just announced at the Sony press conference. The game's out right now for the price of $10, and features crossbuy for PS3 and Vita, too. Built by game design students, Entwined has players controlling a pair of birds in love who can't touch via the DualShock 4's analog sticks. It looks like yet another indie game that should be a touching, tender experience.